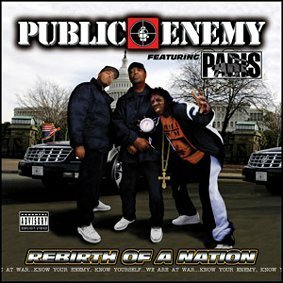 Rebirth of a Nation is a studio album by American hip hop group Public Enemy and Paris, released on March 7, 2006. The album was Mixed and mastered at Data Stream Studio in San Francisco, Ca. Despite the Public Enemy branding on the album, many tracks were written and produced by MC Paris; the album itself was deemed a "special project" by Chuck D in order to differentiate it from other Public Enemy works. The album was released on Paris's own Guerrilla Funk label., HipHopDx.com. The title of the album is a reference to the pro-white 1915 movie The Birth of a Nation as well as one of the group's prior albums, It Takes a Nation of Millions to Hold Us Back. The album features appearances and guest spots by Dead Prez, Immortal Technique, Conscious Daughters, MC Ren, Sista Souljah, and Kam. *Uncut (p. 94) - 3 stars out of 5 - "he old blast furnace of focused fury still rages hard."